Note: This post is about the 2018 Gilder Lehrman Teacher Seminars. If you’re looking for information on the current seminars, check out this post on applying for a 2019 Gilder Lehrman Teacher Seminar. Yes, the summer is a great time to relax and catch up on sleep, family time, and reading. But it’s also a great time to dive into some real, high-quality professional development. If you’re looking for something to nourish your professional soul this summer, think about applying for a Gilder Lehrman Teacher Seminar. They have over two dozen seminars scattered across the country, and they cover a wide range of topics. A number of them are related – directly or tangentially – to civics and would help you be a better civic educator. So let’s take a look at what the Gilder Lehrman Institute is, what a teacher seminar entails, and what are some of the topics you can study related to civics. What is the Gilder Lehrman Institute of American History? The Gilder Lehrman Institute of American history is an organization devoted to improving our understanding of American History. It owns a collection of primary documents and artifacts at the New York Historical Society. It also maintains a network of experts on a variety of topics. The Institute offers a number of programs, including traveling exhibitions that can be set up in schools or libraries and self-paced courses that you can use to explore a topic in depth. If you’re an affiliate school (see more on that later), you can get a free panel exhibition to set up in your school. Students can participate in essay contests with cash prizes and apply for internships. And they provide professional development. They provide customized PD to schools and districts, but as an individual teacher you can apply to attend one of their Teacher Seminars – which we’ll talk about in a moment. The Gilder Lehrman Institute of American History was set up in part with a grant from the National Endowment of Humanities. These seminars are, however, not the same as the Summer Institutes offered each year through a grant from the NEH. I’ll share more about those programs in another post later. 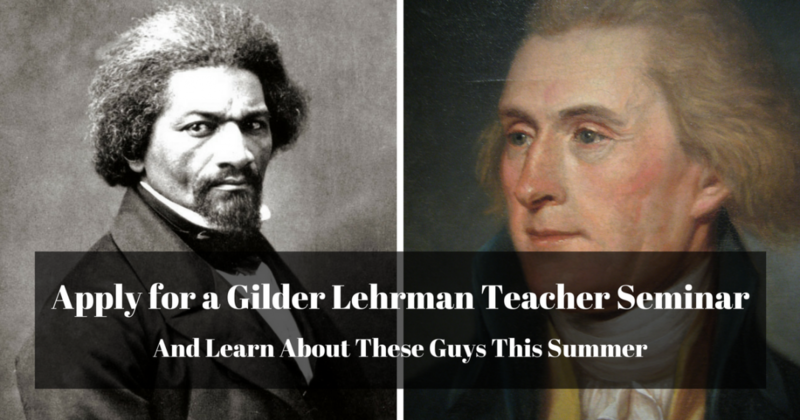 What is a Gilder Lehrman Teacher Seminar? Gilder Lehrman Teacher Seminars are week long professional development opportunities offered at universities throughout the world during the summer. These seminars are conducted by some of the pre-eminent scholars in American history. For example, the seminar on Reconstruction is co-facilitated by Eric Foner. Throughout the week, you’ll engage with these scholars, travel to local historical sites, and work with primary documents. There’s a reading list to complete before you attend, and you’ll complete a project while you’re there. Ultimately, the goal is to dive into the topic and construct lessons that you can use to help your students engage with them. The seminars are spread throughout the country at places like NYU, Stanford, and Southern Methodist, so there is travel involved. The Gilder Lehrman Institute will reimburse you for up to $400 in travel expenses, and they’ll pay for lodging and meals during the seminar. There are international locations – one seminar is in Edinburgh this year – and in that case you receive a $500 travel stipend and you’re on the hook for the rest. You’ll also have to pay a $50 registration fee and you’re responsible for buying the books. So while there is a nominal cost to you as a participant, the bulk of the cost (travel, housing, meals) is being covered by the Institute. A friend of mine participated in one a few years ago, and she loved it. This is a great way to get a taste of high level scholarship and dive into an academic issue as if you were in grad school – without committing to the time and costs of grad school. You can find a full list of seminars being offered this summer here. Which Seminar Topics Relate to Civics in Summer 2018? There are just over two dozen seminars being offered this year. They are all about topics in American History, but some of these will certainly have implications for civic educators. There are seminars that deal with political figures and thinkers in American History, the political history of America, and topics in civics and government. There are likely other topics that would appeal to you from the larger list, but here are five that caught my eye as being particularly relevant for civics teachers. His life was heroic and complex as well as full of personal and public strife. Douglass has been the subject of literary, philosophical, political-theoretical, artistic, and historical analysis for many years. He will always be remembered and studied for at least three major roles he played in the nineteenth century: activist, artist, and thinker. In assessing his biography, we will examine both his public and his private life. If you’re studying history thematically, one major theme that has implications for civics is social change – who has the power to change a society that they experience as unfair and how they do that. The life and work of Frederick Douglass is an excellent lens through which to view this theme. While most teachers are hopefully familiar with at least some of his writings – like the Narrative of the Life of Frederick Dogulass (the Kindle version is free) – it would be worthwhile to dive deeper into his story. We will examine Jefferson’s life and times by considering his efforts to apply the principles of reason to the major challenges he confronted as a revolutionary, diplomat, politician, and elder statesman. Building on Edinburgh’s tradition of Enlightened discourse, we will explore Jefferson’s views of republicanism, slavery and race, gender, education, religion, and international relations through the rich canon of his writings. Studying the founders is an important part of understanding the philosophical underpinnings of the Constitution and the American Republic. Examining the contradictions exemplified by many of these founders is also a useful way to deconstruct the hero myths around them and reconcile the promise of America with the reality of America. As James Loewen argues in Lies My Teacher Told Me, this is an important part of preparing students to be effective citizens. And traveling to Edinburgh is cool. You might have to come out of pocket a bit, but spending $100 to $200 for a week in Edinburgh is definitely worth it. presidency.” Eisenhower demonstrated that the qualities and judgment of the president can determine the extent to which a presidency succeeds or stumbles. This struck me as a fascinating topic. If you teach AP Government, it has direct implications for teaching the Institutions of Government and how the Presidency works. But this is a really interesting topic that often doesn’t find its way into high school classrooms. It’s also relevant today as the news is filled with stories about President Trump’s leadership style, and so I can see this making it easier to build connections between current events and historical presidencies. This seminar examines the historical origins of Black Power and its impact on the United States. Using Memphis, Tennessee, as a focal point, the seminar will explore the political, cultural, and economic elements of Black Power, and the impact of this ideology from the 1960s to the contemporary moment. This seminar is sponsored by Rhodes College and the National Civil Rights Museum. Seminar participants will visit the National Civil Rights Museum, and will also tour The Stax Museum of American Soul Music and Historic Beale Street. Participants will get an opportunity to gather information on digital resources and archival material that may be used in the creation of lesson plans and syllabi. Again, this relates back to that theme of social change. If you teach Modern U.S. History or AP Government, this is going to come up in your curriculum. Exploring the movement at this depth through the lens of a single city will surely give you some great resources to incorporate into your class to make the topic more tangible and engaging. It also looks like there’s a cool itinerary for field trips with this seminar. The judicial and political battles over the United States Constitution’s Bill of Rights have determined the nature of our individual protections against the exercise of governmental power. Bruce Allen Murphy, the Fred Morgan Kirby Professor of Civil Rights at Lafayette College, will examine how the Founders’ vision for the Bill of Rights has been interpreted and revised by the U.S. Supreme Court. By exploring the justices’ decision-making and jurisprudential approaches in landmark constitutional cases we will better understand the nature of our Bill of Rights protections today, how we arrived here, and where the Court might be going next. This seminar gets into one of my favorite topics – Constitutional law and the Supreme Court. No civics class or Early U.S. History class would be complete without looking at the Constitution and Bill of Rights. And you can’t just look at them in isolation – you have to know the history of where these amendments came from and how they’ve been interpreted over time. This is also extremely relevant today with discussions going on about the First Amendment and free speech as well as the ongoing debate over gun control and the Second Amendment. How Do You Apply for a Gilder Lehrman Teacher Seminar? So there is one catch. In order to apply for one of these seminars, your school must be an Affiliate School. You can register your school to be an Affiliate School for free here. More details about the Teacher Seminars are available on the website here, including an FAQ, a full list of seminar topics, and a link to the online application. Applications must be submitted by February 15, 2018, and decisions will be available by March 15, 2018. If this doesn’t sound right for you but you’re still looking for a great teacher opportunity this summer, check out the C-SPAN Teacher Fellowship. Have you participated in a Gilder Lehrman Teacher Seminar before? If so, drop a comment below and share your experience. Also, drop a comment below if one of these topics piques your interest and you plan on applying.